Help your little soldiers get ready for the funjump mission of a lifetime. 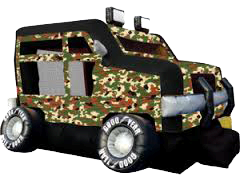 This truck will definitely have you ready to enlist in some fun! Option to have the roof closed or open upon delivery ! The weight limit for this jump is 500lbs. This rental's based price is for 6 hours. If additional rental time is needed we do offer overnight rental which is 25% extra.